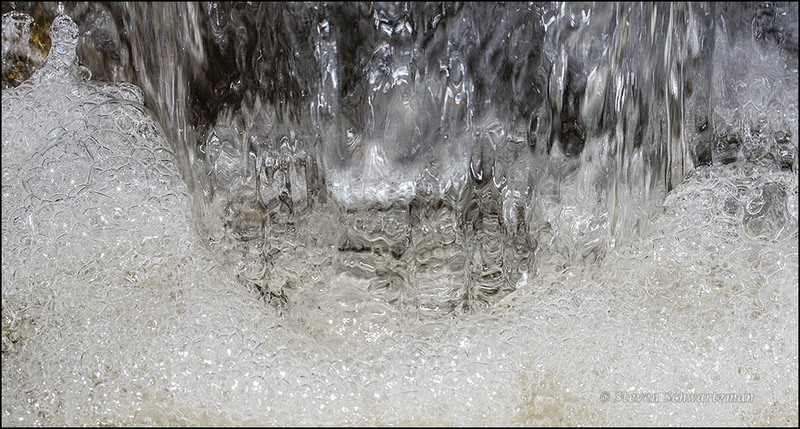 Doesn’t this flowing water at the base of a small waterfall in Great Hills Park on July 18, 2014, look like ice? When I first saw it I thought it was ice! And yet ice produced by nature in the heat of the Texas summer would be quite a prodigy. Quite so! I’d homed in on the photo before reading anything. Remarkable looking photo! I’ve taken plenty of other high-speed (in this case 1/800 of a second) photographs of flowing water over the years. Why this one should have come out looking so much like ice, I can’t say, but I welcome the illusion. And it’s good to hear that you saw the water as ice before you read any suggestion in words. It’s good I didn’t mention ice in the title. Fun indeed: every once in a while I go for an offbeat title. Is it ok with you if I feature this in a post of “not ice” photos, probably just this and one other photo, with the usual credit and links. I’ll agree in a trice. Thanks for your confirmation of the illusion. Now that gets right to the point. I take it people from Yorkshire are known for speaking succinctly. Ah, a turn toward the taciturn. Maybe a disproportionate number of people from Yorkshire settled in Southland. Or maybe the cold Southland winters lead people to conserve energy by speaking less. You’re on the right track… a disproportionate number of Presbyterians from Scotland settled in Southland. Ha! I love the second hypothesis! Are Presbyterians or the Scottish known for being taciturn? If both groups are, that would be a double whammy. My impression is that the Scots have a tendency toward taciturn and that the strict Presbyterianism of the early settlers would have enhanced that. The temp here seems to be heading towards freezing point. My birdbath may resemble your photo by morning. I’m sorry that for you it won’t be an illusion. I can’t report if the icing over happened because I conveniently slept in till all the frost was gone. If any icing over happens tonight, you’ll have another crack at it. We’ve had some very muggy weather, and this is a welcome, refreshing illusion. If you’re branching out, from your customary flowers and landscapes, maybe next time, instead of a waterfall, you’ll do scotch on the rocks? or a Presbyterian (scotch and ginger ale), or whiskey-and-branch? In the days ahead I’ll be giving you some rocks, no doubt about it, but without any scotch or Scotch on them. And there are bound to be some branches, but again sans whiskey (and let me branch off to say that I had to look up the drinking-related sense of branch). In short, the only spirits are likely to be those stirred by nature. I think it’s a geographic expression. My dad drank “bourbon and water” — that was the midwestern way of saying it. On the other hand, my folks’ best friends, in Kentucky, used the phrase “bourbon and branch” — probably because they were accustomed to water from a branch, which was what we called a stream or creek. I assume the term “branch” originally got applied to a branch of a larger creek or river. Perhaps for some people a branch eventually came to refer to any creek, even if it wasn’t actually a branch of a greater watercourse. Spirited writing is something I’m happy to attempt. As proof, I promise I’ll even aspire to 200 proof. I was so sure you’d photographed ice, I thought it was a photo from your northern travels. It certainly looks cool — even as water. Could it be that the clarity of the water is part of the reason for the icy illusion? It almost makes me eager for winter. I’d left a half-empty gallon of Ozarka on a boat yesterday, and when I went to work this morning, I noticed that condensation had formed hundreds of tiny droplets on the inside of the bottle, above the water level. They looked remarkably like these bubbles. I’m not quite sure how to get a photo of the inside of a bottle, but it might be fun. The temperature was in the 40s on our first few days in Canada, but fortunately never got below freezing. Why the water in this little waterfall in my neighborhood looked so much like ice remains a mystery. I can’t say the water was clearer than any other water I’ve photographed here. When it comes to being eager for winter, Texas in July makes a lot of people feel that way. I’ve seen lots of bubbles inside a bottle, just as you described. I don’t know how you’d photograph that. I’ve also seen lots of condensation bubbles on the inside of a glass lid over a pot of liquid. There at least you could lift the lid and photograph the zillions of bubbles from below. In fact I vaguely recollect having done something like that once. Let us know if you try something of the sort. Welcome to the club of summer ice-seers. Maybe we are all wishful-thinkers. Actually, we are enjoying a cool spell and at the moment I have cicadas rattling away in my garden. I love that. No cool spell here, with highs around 100°. I’m trying to remember what the singing insect expert I recently heard speak said about that. I seem to remember he pooh-poohed it. Most cricket species, of course, are not pests. That is pretty cool. Or should I say, warm. And some of them are pretty tasty! The Spanish word for cricket is grillo, which leaves open the way for a cross-language pun about how to cook crickets. LOL! My son and I were just talking about that. I’m not sure I’m that hungry yet but I’m receptive to the idea. In abstract. To which I will charitably say: Yukk. Oh, dear! Crunch I can deal with. Legs stuck between my teeth, I’m not so sure about! Did you see the movie Hidalgo? I loved the scene where he and his horse sort of shrug and start eating the locusts that are sweeping over them. No, I’ll have to rent it, Viggo Mortensen is a good actor. But I’ll check the popcorn carefully before I start watching. I’d say an unpopped kernel is a much greater risk, but you never know. Yes, I think that was the idea. It was the name of the horse, a mustang descended from conquistador horses. Now if I can just get me a conquistador camera. With shiny silver spurs. I think that would add quite a bit of weight, though. It sure does look like ice… kind of made me feel all coolie in this triple digit heat! You might call it an anti-faunching view. Without your description/explanation, I would never have recognized this as a waterfall. Sometimes it takes words, and sometimes I’m happy to offer up those words. Although I’ve often enough taken high-shutter-speed pictures of falling water, I don’t know why the water here ended up looking so much like ice. Whatever the reason, I’m glad it did. On our recent RailTrailsRopadTrip I tried high-shutter-speed of waterfalls, but even at the highest setting my Nikon D500 allows [1/8000s] they didn’t turn out the way I had hoped for: still too blurry. Slow-shutter-speed pictures turned out fine. I often take pictures of a waterfall at various speeds because it can be hard to know what’ll work the best. Of course if you’re going for a cottony, hazy look you have to use a slow shutter speed—but even then the question is how slow to go to get the best look. I did various shutter speeds, too. I still have to look at those pictures closely and see which are the best. I’ll put some on my blogs when I have come to those. I’m very slowly making progress with all those pictures I took on our recent road trip. Just now I’m revising and editing pictures from day 5. The waterfalls were on day 6 [Tallulah Gorge] and on day 9 [Looking Glass Falls, NC]. I wish you well with your sorting and editing. I recently bought a matching pair of 6TB hard drives to store the photographs from 2017 and 2018. Both years will fit on one drive, and the other drive will serve as the backup. 6TB?! Wow! My desktop has 3, and I still gave plenty of space. For back-up I use a Western Digital 3 TB hard drive, directly connected to my router. This way it serves as a “personal cloud” which I can access from wherever I have internet access. Very helpful when travelling. I prfer this version of “cloud” storage because it always is under my control. I empathize with you about having a ‘cloud’ that you control. My camera takes 50-megapixel photographs, so the files are rather large. That said, a 6TB drive will still hold more than the photographs from 2017 and 2018, maybe even all the ones I’ll take in 2019. So far I’m averaging fewer pictures this year than last year, which was unusually travelsome and included New Zealand, the central part of the U.S. up through South Dakota, and the Canadian Rockies. In any case, the price for storage keeps declining. I bought the 6TB drives on sale at Costco for around $120 apiece, and each came with two free months of Adobe’s photography bundle. It is really amazing how cheap storage has become, and how small the devices are nowadays. I still remember my first 80 MB!! hard drive: it was the size of a goodish brick! My Nikon D500 produces way smaller files. So I don’t think I’ll run out of storage space any time soon. It does, I thought it was ice! Gorgeous! Isn’t it strange? Even if I can’t account for it, I welcome the illusion.